Papers of Frank Healy, Folklore Dept, UCD. 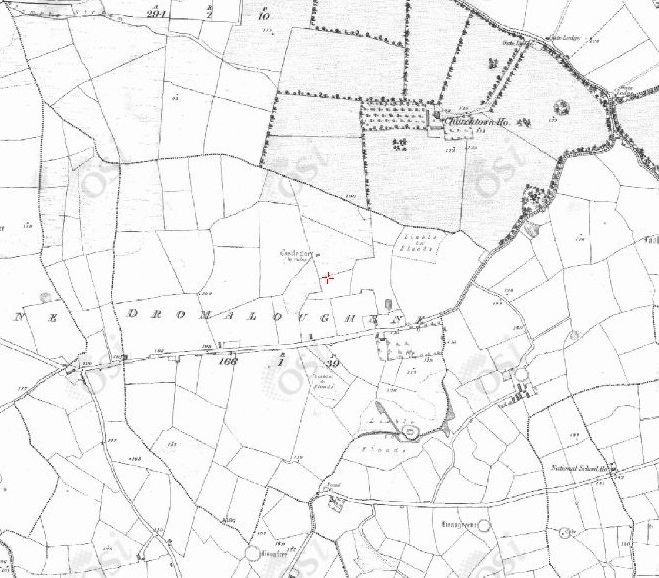 Dromaloughane, W of Killarney, Co.Kerry, on 1887 to 1913 map. O'Sullivan/Sullivan is the most common surname in Munster, and the most common surname in Co.Kerry. 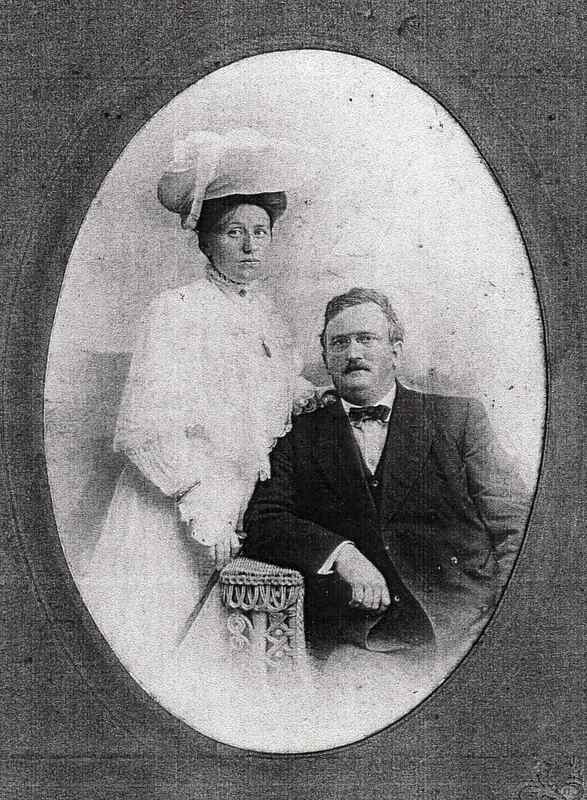 See other O'Sullivans and Sullivans in the family tree. He is listed as "James Sullivan" consistently at his mar and children's bapts and son's birth and son's mar. So think his son's obituary is wrong to list him as "James Joseph O'Sullivan". Children all bapt Sullivan, not O'Sullivan. 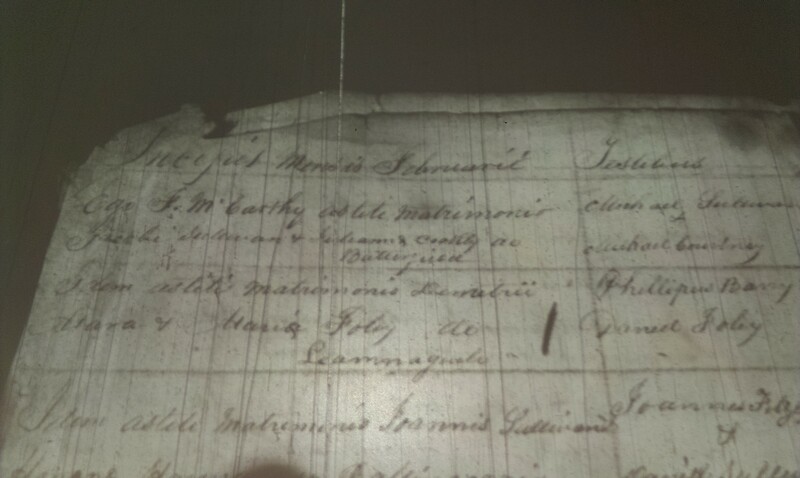 He mar 1 February 1855 [Firies RC par records], see image, to Julia Coakley [dau of Cornelius Coakley and Bridgid Sullivan]. Mar wit by Michael Sullivan and Michael Coakley. She (not he) is listed at mar as of Batterfield, Firies, Co.Kerry (between Killarney and Tralee, see map). He was farmer at Dromaloughane, Knockane civil parish (Beaufort RC parish), NW of The Gap of Dunloe, W of Killarney, Co.Kerry (see map). Beaufort parish is also called Tuogh parish. 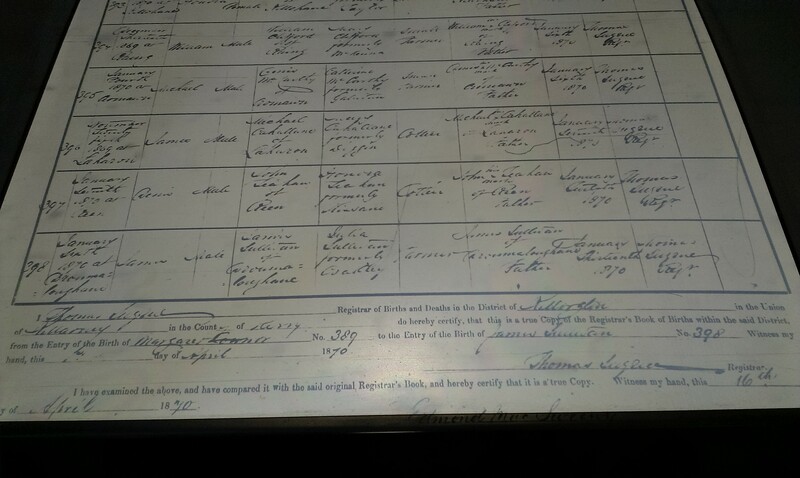 He is listed at Dromaloughane at children's births and baptisms 1857 to 1870. His son's obituary in 1935-36 is wrong to say he was a "physician in Killarney". He is not listed among doctors of Killarney in [Slater's Directory, 1881]. He is not listed among doctors of Ireland in [Thoms, 1884]. Perhaps this is confusion with his son's brother-in-law Dr. William O'Sullivan of Killarney. He is listed as "farmer" at his son's birth and mar. Mary Sullivan, bapt 11 January 1857 [Beaufort RC par records]. Denis Sullivan, bapt 13 June 1858 [Beaufort RC par records]. Patrick Sullivan, bapt 22 March 1860 [Beaufort RC par records]. Bridget Sullivan, bapt 1 March 1862 [Beaufort RC par records], must have died young. Bridget Sullivan, bapt 22 April 1865 [Beaufort RC par records], must have died young. Bridget Sullivan, bapt 23 December 1866 [Beaufort RC par records]. mar Frank Healy [prominent nationalist barrister, of Cobh] and had issue. might have been 1884 (see below). Birth cert of Jim Sullivan, born 6 Jan 1870. Jim Sullivan, think with his sister Ellen. The Furnessia, of the Anchor Line, sailed from Glasgow on 23 May 1884, stopped at "Valencia" (would be Valentia, Co.Kerry), arrived New York on 3 or 5 June 1884. Denis Sullivan, age 25 or 26. Note there are a lot of Sullivans on this single sailing alone (it is the most common surname in that part of Ireland) so the above may just be coincidence. (todo) See original record to establish if the above were all travelling together. Jim Sullivan was said to be a relation of the politician John Marcus O'Sullivan. But this may be confusion with his brother-in-law Dr. William O'Sullivan, who was a 1st cousin of John Marcus O'Sullivan. On the other hand, those O'Sullivans are connected to Batterfield and Dromaloughane, and so are these Sullivans, so all of them may be related.